Let’s say you love Persian and Oriental rugs – their workmanship, their patterns and colors, their quality. But let’s also say that your home has wall-to-wall carpeting in practically every room. You decide to purchase one of these fine rugs, but you don’t really want to place it in the kitchen or in a bath (where there is no carpeting). You want to display it in your living room or dining room. You want – in other words – to showcase it, to show it off to guests as well as family members! But that wall-to-wall carpet….. Can you – should you – place a Persian or Oriental rug over carpeting? Read below for some tips on how to do so to best effect. Read below for some tips on how to showcase this beauty – an Iranian medallion rug – on your wall-to-wall carpeting. If possible, purchase a Persian/Oriental rug that works with the color of your carpeting. You don’t want the colors to clash – you want the rug to stand out, but you don’t want it to scream “I’m here, I’m here!” You want the rug to harmonize with, not distract from, the room’s overall color scheme. Unless your Persian rug and the other area rugs are heavy, consider purchasing rug pads to place on the carpeting, and then place the rugs on the pads. This helps prevent shifting and wrinkling of the rugs. 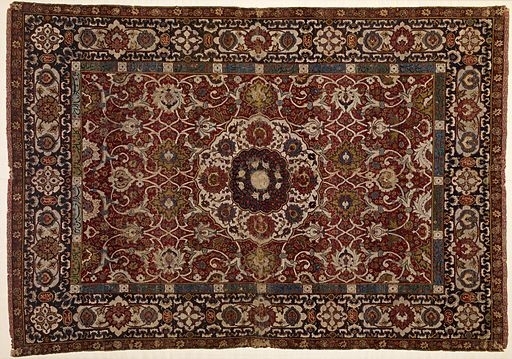 One important caveat: your carpeting should be of a low pile – such as a Berber carpet. The pile of a shag carpet, for example, is too deep/high to place any rug over it, whether it’s a fine Persian/Oriental rug or not. Aim to layer rugs that have similar patterns. A floral rug layered with a geometric rug or carpet has too much contrast. Finally, don’t be afraid of placing a Persian rug over your carpeting. Doing so can add some warmth and texture to a room, all they while showcasing the beauty of your Persian or Oriental rug. If you’ve decided you want to purchase an Oriental or Persian rug for a room in your home – carpeted or not – visit the Dallas-area showroom of Behnam Rugs. Contact us at 972-733-4000.